• Each piece of this set is fully able to handle anything you throw at it with ease. 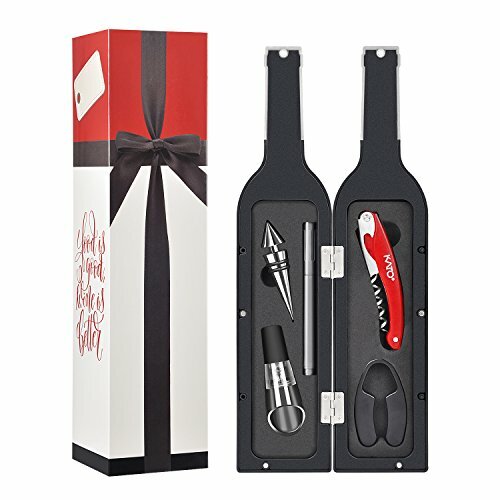 • Design: Hold all your wine opener tools in a red wine shaped box, this lovely set can be stored nearly anywhere as its compact design. • Perfect gift for Christmas Day, Thanksgiving Day, Mother's Day, Father's Day, housewarming, birthday, holiday, wedding or anniversary. • The glass stickers include some adult themd stickers, they are packed in a black envelope with words "Adult Only" signed on it. So if you don't like it, just take them out from normal glass stickers. GREAT WINE LOVER GIFT - Kato wine opener set provide everything you need to enjoy your favorite wine, The pretty outer sleeve with Gift package pattern wrapping on the box and the creative wine bottle shaped case make this a perfect gift choice for any wine lovers in Father's Day, housewarming, birthday, holiday, wedding or anniversary. WINE OPENER SET (5 pcs) - Includes: 1pc multi-functional hippocampus knife, 1pc wine stopper, 1pc foil cutter, 1pc aerator pourer, 1pc silver glass paint marker all displayed in a wine bottle shaped gift case. REUSABLE GLASS MARKER STICKERS- This wine accessory set come with a static cling reusable drink markers set. Stickers are an ideal way to personalize your guests their wine glasses. Easy to use. Never drink from the wrong wineglass again! CUSTOMER CARE PROMISE - We always provide excellent product and service to our customer. For any reason you aren't satisfied with wine bottle opener set, CONTACT US directly and we will take care of you. We love to help!